I offer one of the most recommended Bali tourist attraction to complete your holiday experienced in Bali. 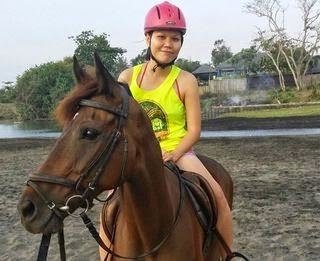 Horse ridding, the exciting experienced by enjoying the Rice Padi, Village and Beach view along the green natural village named Pererenan. 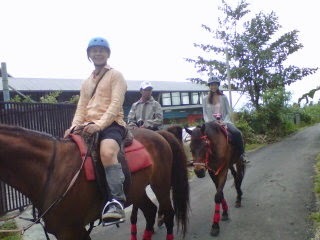 Available the short or long ride plus Pony Rides for children. Experienced riding event it also offer Therapeutic Riding for the disabled, plus Individual or Group Lessons. 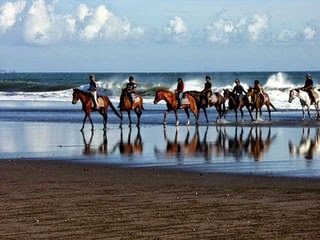 There is a suitable ride for every taste and, whether you are a beginner or an experienced rider, your time to ride the horse will complete your Bali holiday. Ride Horse through the lush Rice fields, quiet Villages and the beautiful Pererenan Beach. PICK UPS: 8.00 – 8.30 A.M. or 2.00 – 2.30 P.M.
Includes of Safety gear (helmets, chaps etc.) / Basic Instruction / Tea / Coffee / Soft Drink / and our delicious Pisang Goreng. Please note that the horse rides will not accept any riders whose weight is over 100 kilos. Any question please email me! Comment: We contacted Ketut at Bali Land Tours for a custom itinerary. We had a wonderful time, Ketut was very knowledgeable and friendly. He even allowed us to make some itinerary changes on the fly. We had wonderful personal service catered to our interests. I highly recommend Bali Land Tours. You'll have a wonderful time in Bali. .........Read more comment!